Schwartz and Wade Books, New York, 2011. 32 pages. Here's a truly wonderful wordless picture book. Chris Raschka portrays the heights and depths of emotion with simple painted lines and colors. 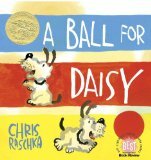 A Ball for Daisy features a little dog named Daisy. You can clearly see that Daisy loves her red ball. She plays with it, wags her tail when she catches it, and cuddles up next to it for a nap. But when Daisy and her owner take it to the park, another dog begins to play, and he pops Daisy's ball. Daisy's sadness when this happens is unmistakeable. Fortunately, there's a happy ending as the other dog and its owner make things right the next day. The pictures in this book are exuberant and varied, making the simple story great fun to read. The pages where Daisy's trying to figure out what happened to her ball include shaking the limp casing, howling, and just being sad. The pages where Daisy is playing or sleeping reflect Daisy's joyful and unworried existence. There's a nice circular feeling as the end echoes the beginning, with Daisy cozying up to her new ball. All's right in the world. What child doesn't know what it feels like to lose something? The story is universal, and can be "read" by the very young, yet will still fascinate older people with the beauty of the artwork. I'm pleased with the Caldecott committee's decision this year, as I have a feeling children will be enjoying this book for years to come.